WOW!!!! Such an amazing story!!! Wow, what a post! I can hardly see what I am typing through my teary eyes! Thank you for reminding all of us what is really important about this fantastic career we have chosen as educators. We are often much more blessed by our students than they are by us! What a fantastic story! It’s apparent to me that your connection (Johnny Cash) grew into a relationship and with that a trust was formed. A great lesson to all of us in the power a teacher has to inspire confidence. Chris, Even before I finished reading the post I knew who you were talking about. You are right about his smile. Thank you for posting this and I hope you get another response from Dom. It is a gift to see children like Dom with a passion that can touch so many others. 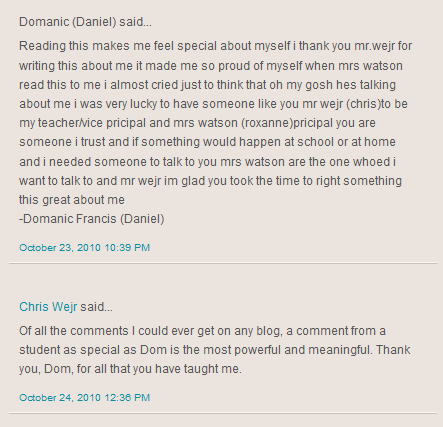 How fortunate for Daniel/Dom to have encountered you: a teacher who was prepared to acknowledge that he didn’t know it all and was determined to learn. Sadly, there are not enough like you out there. There are altogether too many teachers who have ‘seen it all before’ or ‘cracked tougher nuts’. Thank you for being the sort of teacher who was prepared to learn from your students. How rich your life will be as a consequence. Thank you for sharing this story. I am facinated by the successes and brightness that develops when we, as educators, begin to focus on each student’s individual strength. Moments like the one you have shared are one of the primary reasons I chose to become a teacher. I am just a newbie (completed PDP Dec. 2010 and am a TOC in Coquitlam, BC) but I look foward to these moments I will experience throughout the years. This is a very inspiring story! I commend you for really taking an extra mile for Daniel. I am truly with you on the matter of providing a stimulating environment for the students. That’s a big responsibility that teachers nowadays should fully address. It is only through providing different media for learning and creativity that these kids can discover their potential. Thanks, this is a great read! If there were more teachers like you who cared about children and put in some effort to encourage them in a happier, better direction, the world would be a much better place. I would agree to everyone. It’s a big WOW. It makes me so happy to know that you had bring out the thing that Daniel loved to do. It is so inspiring. I wish I knew what I’m good at so I would also excel at it. Great job Chris. I agree with you. So many teachers nowadays are losing the passion to teach. And really, just going an extra mile further for a student means so much especially to the parent of the child. I commend the writer for being a great teacher and more importantly for being an individual worth looking up to.